I’ve wanted to add more information from Norma Schafer/Oaxaca Culture and my study tour in Chiapas, but it’s taken me many months to get to it. In fact, I’m returning to Chiapas for the 2019 tour, in February, so I wanted to share this. I’ve had more questions from friends about ‘what I do‘ when I’m in Mexico? What immediately comes to mind is visiting the artisan in their homes. It’s honestly my favorite activity/experience and it’s always a bit of an adventure and often a surprise and very intimate. It is a great honor to share a meal or some fresh made tortillas with a rural coop or family in the campo /country-side. There is always a fire going in the open-hearth as that’s the main cooking place. The smell of wood smoke, the busy hands over the comal / disc -platter of ceramic or metal, where tortillas are prepared; ingredients are toasted and roasted; eggs are fried; you name it and it can cooked on the comal. I love the pot resting against a burning branch, beside the comal, sending off it’s sweet scent of coffee or beans simmering. The chairs are of a very rustic, of simple wood construction, often on a scale for people much smaller than I am. The dishes are often enameled tin or simple glass soup bowls from China. The glasses have old-fashion decals on them. There is always a HUGE bottle of some sort of orange soda or Coca Cola on the table…you can pretty much count on it! Hanging from the rafters or walls corn is drying, baskets hold herbs and maybe onions. I love the rough adobe walls some as old as the owners great grandfather now deceased. More likely they are concrete brick construction with metal roofs elevated in the corners to let the smoke out. Oh yes, the floors are dirt and swept but smooth with many years of feet traveling back and forth. These homes are the gathering places where the family comes to eat and get out of the sun or rain, rest and sleep. During the day these humble homes are illuminated by the open doors and maybe one open window, it’s shutter thrown back. Our tour : Chiapas Textile Study tour...Feb 26th – March 6, 2019 is now filled but message me to be notified for next year. We are based out of San Cristobal de las Casas, Chiapas and if you’ve been wanting to explore Highland Mayan textiles this is the trip or you!! (This is the 4th time we done this one!!) The previous post also explores local markets and artisan centers we visit during the tour….check it out. All part of our adventures in Chiapas’ Textilandia! A weaving coop in Aldama, who cooked us a delicious chicken soup! The women bring their children when they come together to weave and visit. These images are the weavers from an out-lying Chamula community doing demonstrations of back-strap weaving techniques, carding and spinning sheep’s wool. This year I was fortunate to be part of two textile study tours of Chiapas organized by Norma Schafer – Oaxaca Culture, who you might remember, contributed two chapters to my “Textile Fiestas of Mexico….a travelers guide”. These tours are intimate adventures into the lives of the traditional weavers and embroiderers of Mexico….so they are usually around 10 travelers. This allows us to visit markets, museums, and private homes with minimum impact. We try and time our visits to the villages surrounding San Cristobal de las Casas, Chiapas so that they coincide with local market days. Often the village officials are present dressed in their magnificent ‘traje’/costumes (we are usually not allowed to photograph either) and the local ladies are dressed in their best textiles. Since I’m a big fan of traditional traje (if you haven’t noticed) then dressed-up ladies sets my textile-loving heart trembling – as well as my eyes darting. It’s so exciting to trail behind these beautifully dressed women, admiring closely their ribbon-braided hair and the way their fajas/belts, tied tightly around several yards of folded or pleated fabric, manage to stay in place. MY next post will share visits into artisan homes in Aldama, San Andres Larrainza and a community of widows in Chamula country side. Tenejapa Textile coop – a few doors to the right of the church….don’t miss it! There is always the possibility of catching a special event and we caught the Carnival festivities. Everyone in RED outfits racing around the Tenejapa plaza with flags…..and whooping! Step back…!!!!! Here they come! In Zinacatan it was a quieter market and focused on materials for their highly embroidered trajes. Many choices of colored threads and possibilities of custom made garments…. Zinacatan ladies shopping for materials for their flowered trajes. Measuring for a custom poncho. Home shrines are part of most shops….the Virgincita is dressed in Zinacatan traditional clothes. Chamula has the Mayan crosses covered in pine boughs and the mysterious church with Mayan healing ceremonies (which you can’t photograph)but which leave a lasting impression. Outside there with many artisans wares. Baskets of pine needles, gourd containers, clay incense burners…….all at the Chamula market. NEXT BLOG POST: Visiting Artisans in their homes…..stayed tuned! Besides the exciting festivals and ferias of Mexico, there are wonderful local markets to experience every week, so don’t miss out. Back in Mexico this winter I visited two that have become my favorites and I won’t miss an opportunity to go there. Living very close to this market for six months a few years back, I went here every Sunday for my vegetables, fruits, and flowers and was usually on the look-out for a special blouse, embroidered apron, or something special to add to my collection. There are many vendors catering to those who love artisania whether it be red potter burnished by hand, caved gourds from the costa, hand sewn Zapotec dolls with authentic costumes, or beaded hearts along with charms for cures and protection. It’s a wonderland of charming cosas (things). It’s all part of a larger regional market where locals go for necessities like shovels, plastic containers, ropes, matates (corn grinding stones)—watch women trying them out—and many other surprising items. Searching out what is authentic to this location is the fun part of visiting Tlacolula. Of course, part of the experience is the food. 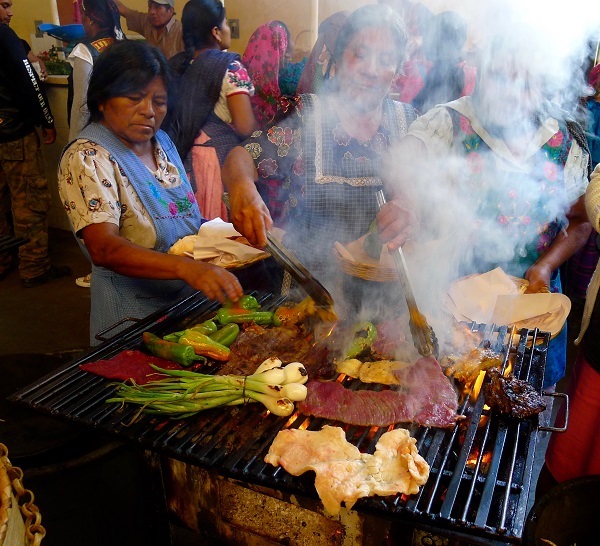 A specialty of Tlacolula is the grilling of tasajo, a thin sliced beef and green onions. You can smell it as soon as you enter the indoor market area. Also there are booths that sell very yellow chickens for stew as they are free range and a bit tough. 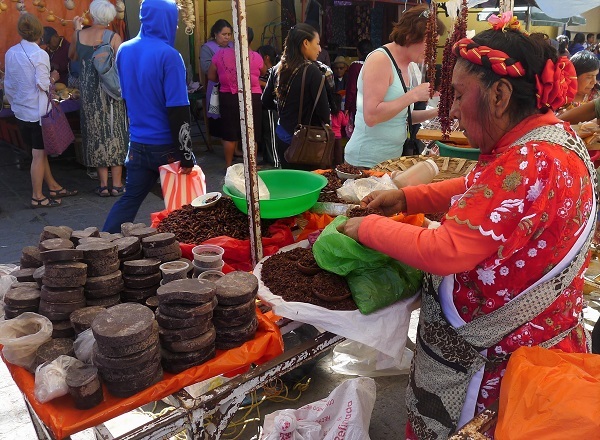 Keep your eye out for the chocolate vendor who also sells chapulines (grasshoppers), a Oaxacan delicacy. 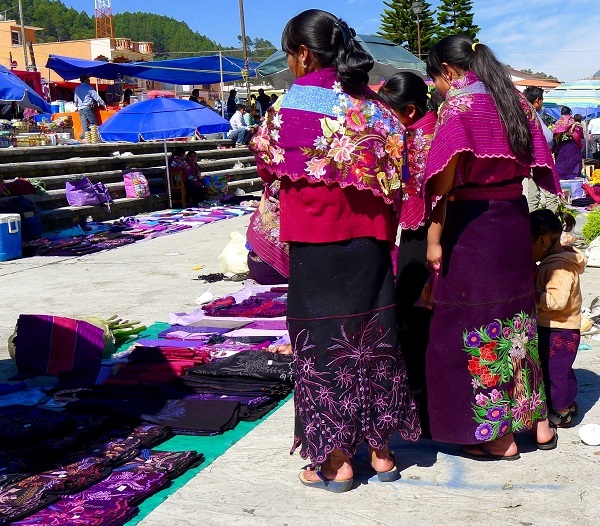 You won’t easily forget Tlacolula market nor the wonderfully dressed local Zapotec ladies. Remember to visit the over-the-top baroque chapel next to the church. I didn’t discover this market until a couple of years ago, and I’ve decided I need to drop in every time I’m in San Cristóbal. Not a very huge market like Tlacolula that stretches many blocks in the center of town, Zinacantán is held on a large concrete slab lot next to the church. Open air with very few tarps for cover, goods are laid on the ground for all to peruse. Since Zincantán’s traje (traditional dress) changes colorways faster than any other Maya group, (at least yearly), it is a great place to see the latest in base cloth for their capelets, threads for their embroidery, and accessories ready to become fashion. Also for sale are rubber shoes, flip flops, and shiny hair clips that complete their fashion statement. Of course there are some food vendors, and a few general vendors, but it’s mostly about what’s in fashion in Zinacantán. I spotted some intricate cross-stitch items that I learned were machine embroidered in Guatemala. I saw belts with this fabrication last year that now has made an impact on the capelets and who knows what will happen next year! WOW is all I can say! This market is also a great place to view the ladies visiting on Sunday and mothers and kids all dressed in the traditional Zina outfits. The young men also cut fine figures striding along in their flowered tunics with long tassels swinging. WOW again! 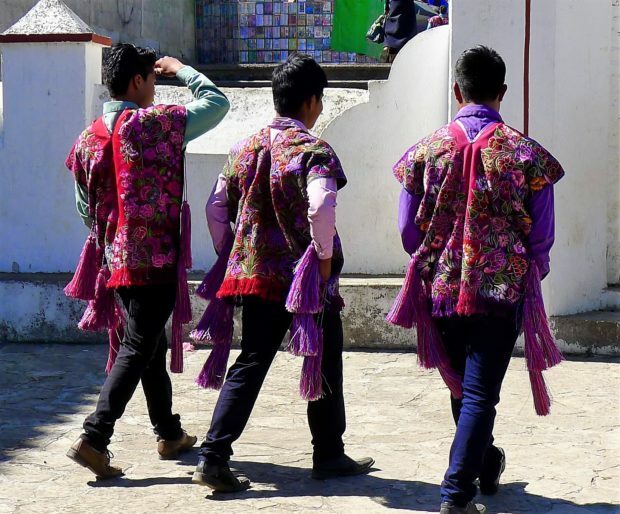 If you are following Zina fashion and its extravagant floral patterns on everything, you won’t want to miss “whatz new” at the Zinacantán market near San Cristóbal de las Casas, Chiapas. To learn more about the Tlacoluca and Zinacantán markets plus a whole lot more, pick up a copy of Textile Fiestas of Mexico: A Traveler’s Guide to Celebrations, Markets, and Smart Shopping. Available at ClothRoads, Amazon, and at your favorite local bookshop. Available in Mexico at Abrazos. Early 2017 and I’m off to Mexico in a few days…so looking forward to being back in the color and friendly chaos of the ‘pais mas amable’ in North America! As you probably know from my last few posts – the “Textile Fiestas of Mexico…a traveler guide” was published Fall 2016 by THRUMS and has been selling briskly ever since. THANKS to all my fans who have given multiple copies to family, Mexico aficionado and textile friends for Christmas!! You rocked my sales. Amazon is on it, as well as direct sales from my www.etsy.com/shop/living textiles. Learn about Mexican textiles from textile aficionado and author, Sheri Brautigam,”Textiles Fiestas of Mexico: A Traveler’s Guide to Celebrations, Markets, and Smart Shopping.” Sheri will be giving a special slide lecture geared to independent travelers, guiding the reader to the textile regional markets and artisan events in the states of Oaxaca, Mexico, Chiapas, and Puebla. Second book presentation will be at the Oaxaca Lending Library Pino Suarez 519, Oaxaca – Jan. 30th at 5pm. Hope my Oaxacan friends can attend, as it will be great to see you all. Some copies of the book will be available for sale, a % of sales go the library. 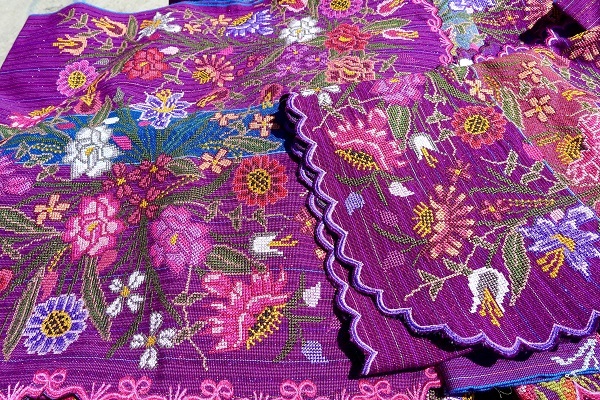 VIVA las FIESTAS y mercados of Mexico and finding beautiful traditional textiles, which is what the book is all about!! Imagine a 6 month time-frame to write a textile travel guide to Mexico. Challenging and a bit scary, but I decided it was definitely possible. After all, I had been documenting textiles for about ten years in Mexico and was a frequent visitor to all the fiestas and markets there. It was all familiar and I had over 40,000 pictures. Off I went last January to re-visit all the locations of the fairs and the very exciting markets covered in my book Textile Fiestas of Mexico. I needed to fact check with local experts and make sure my information was correct and fill in missing images. What I was slowly realizing was that I couldn’t do it alone. Guelaguetza, the colorful exuberant festival in Oaxaca, was in July, far beyond my deadline. While I had pictures from previous years, they weren’t the dynamic ones I wanted. Guelaguetza in Oaxaca, Mexico. Photograph by Alejandro Aquino. Enter Facebook! Trolling through images of this Oaxaca festival, I stumbled onto a Facebook page for Guelaguetza, and there were the perfect images. The photographer, Alejandro Aquino, had a familiar style of composition and feeling that would fit with my style—one of being there and right in the front row! It took me awhile to get a dialogue going with Alejandro and to ask him to contribute to the guide, but we finally connected and he said, “Yes.” Then I got to pick out his images of the festival to fit my text along with the editor and designer who then did their magic. I met Alejandro Aquino in January for a short interview, which I hope will lead to further exploration of his work. He’s a young sensitive guy in his late 20s from Zinatlán de Alvarez, Oaxaca. He was an independent photographer for the journal Noticias Voz e Imagen de Oaxaca. Now he’s focusing his photography on el campo y realidad de la gente (the countryside and reality of its people), la pobreza (poverty) being one of his prime themes. El mar y el cielo (the sea and sky) strongly draw him in, too. I can’t wait to explore more of his images soon. Currently, Alejandro is a secondary school teacher in a town near Oaxaca. Author and photographer Norma Schafer. Norma Schafer, a friend and the person who invited me initially to stay in Teotitlan del Valle in 2009, contributed two dynamic market chapters to Textile Fiestas of Mexico. The first is about Teotitlan del Valle, the very important rug weaving center of Oaxaca, where Norma actually lives. She knows the complex story and who the best natural dyers are in a village of over 200 weaving families. Her perspective was essential to the guide. An accomplished photographer, she took on my last assignment in Tenancingo, the traditional rebozo weaving capital near Toluca and Mexico City. She leads study tours and just happened to be visiting before my March deadline. Que Suerte! (What Luck!) Thank you, Norma. She did a great job and the images are super. Who wouldn’t want to go rebozo shopping in Tenancingo? At the Teotitlan del Valle rug museum. Photograph by Norma Schafer. Norma Schafer is a published writer and photographer and since 2006, she has offered curated study tours, workshops, and specialized programs throughout Mexico. Through Oaxaca Cultural Navigator LLC, she takes you beyond the ordinary to introduce you to Mexico’s most outstanding artisans who are off-the-beaten path and internationally recognized. Her tours are limited in size to give you the most personal experience. Workshops and one-day natural dye textile study tours can be scheduled to suit individual travel plans. Norma has over 30 years of experience creating international award-winning programs for Indiana University, University of Virginia, George Washington University, and University of North Carolina at Chapel Hill. YES, I met my deadline in six months, with a little help from my friends! Meet me in person, get an autographed copy of her book, and learn more about traditional textiles of Mexico in a special presentation October 16th at Bella Frida, in Louisville, CO.
My friend and contributor Norma Schafer has posted on her blog, Oaxaca Culture, about her contributions to my book “Textile Fiestas of Mexico – a travelers guide”. Norma covered two very important traditional textile centers included in my textile adventures in Mexico: Teotitlan del Valle, the rug weavers of Oaxaca, and Tenancingo, the famous rebozo weavers in the Estado de Mexico, near Mexico City. Here’s the link to her Oaxaca Culture blog and the whole story!! Some lovely preview images of Teotitlan del Valle and Tenancingo from the guide, to encourage you to go there! Check out AMAZON to order this colorful HAPPY guide full of beautiful pictures and lots of helpful tips for a full-on artisan experience in Mexico. This is for you lovely followers who have subscribed to Living Textile of Mexico and haven’t heard from me for over a year! I guess the question is…Why has my blog been deeply unattended? The answer is… you are conjuring up and writing a BOOK ! This is something I’ve been working unconsciously since I moved to Mexico in 2007 and starting documenting my adventures visiting fiestas and markets in the State of Mexico, Michoacan, Puebla, Oaxaca, and Chiapas. Particularly these places, as they have the largest indigenous communities in Mexico and therefore have the widest variety of traditional textiles. Of course, I was collecting and developing relationships with artisans in these places as I returned to some many times. Then came the incubation period, beginning in 2011, when I returned to the states after four years in Mexico. I started thinking about how I could be helpful and promote these traditional artisans and the complex and amazing labor that they went through for each beautiful item I was seeing and sometimes buying. I started talking to museum curators and other photographers and authors in Santa Fe, NM, who I knew had undergone the process of publishing. Honestly, for such a niche market subject, it looked unlikely I would find a publisher and publishing this information myself seemed rather a daunting task, but I hung in there. I made a pretty iBook sample with my best photos, illustrating the concept I was trying to develop and showed it around for a couple of years. I even sold some of these expensive little copies to a few friends. Here’s my lively guide to where and when to go Mexico and what to buy ! It should be very useful to you textile junkies out there, who want to explore Mexico, and remember these places are safe to visit and also have great food and lodgings. Carry on, go there… and collect some wonderful textiles! Thanks for your patience. You can pre-order on Amazon, NOW (so you won’t forget) or it could be in your favorite book store if you ask them to order some from THRUMS.